Our Specialized Bale Handlers are designed to handle a wide variety of baling needs and a rugged enough to deliver the same decades of trouble-free operation as the rest of our equipment. The Model 41 will grab a layer of compressed bales measuring up to 48"x96." Hooks should enter the bales parallel with the ties or straps, so a Model 41 is designed to approach bales with the ties running horizontally across the path of the forklift. The Model 41-H will grab a layer of compressed bales measuring up to 48"x96." 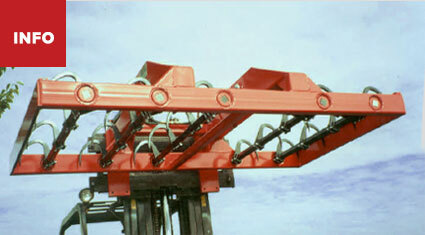 Hooks should enter the bales parallel with the ties or straps, so a Model 41-H is designed to approach bales with the ties running vertically along the path of the forklift. The Model 45 will grab a layer of compressed bales measuring up to 48”x96.” Hooks should enter the bales parallel with the ties or straps, so a Model 45 is designed to approach bales with the ties running horizontally across the path of the forklift. While this frame is the same dimensions as a Model 41, the fifth hook bar gives this unit the ability to handle Canadian and Australian 16x18x18 compressed bales. The Model 46 will grab a layer of compressed bales measuring up to 68"x96." Hooks should enter the bales parallel with the ties or straps, so a Model 46 is designed to approach bales with the ties running horizontally across the path of the forklift. 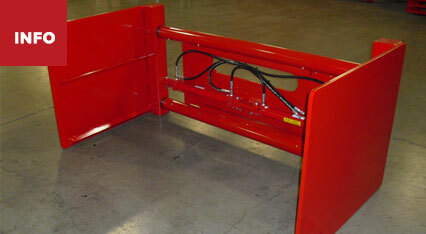 This unit is specifically designed for loading high cube containers with two bales flat, then three bales tall. The Model 51 will grab a layer of compressed bales measuring up to 96"x96." 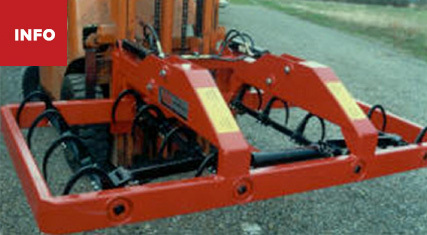 Hooks should enter the bales parallel with the ties or straps, so a Model 51 is designed to approach bales with the ties running horizontally across the path of the forklift. The Model 51-H will grab a layer of compressed bales measuring up to 96"x96." 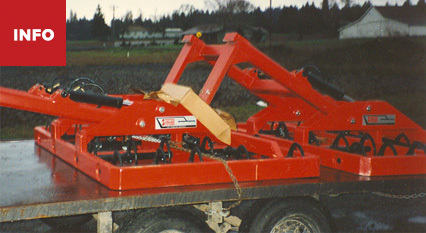 Hooks should enter the bales parallel with the ties or straps, so a Model 51-H is designed to approach bales with the ties running vertically along the path of the forklift. Also available in longer versions for bigger packages. The Model 71 will grab a layer of compressed bales measuring up to 96"x96." 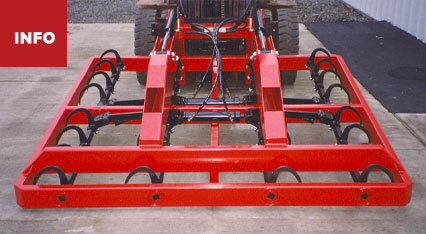 Hooks should enter the bales parallel with the ties or straps, so a Model 71 is designed to approach bales with the ties running horizontally across the path of the forklift. While this frame is the same dimensions as a Model 51, the fifth hook bar gives this unit the ability to handle Canadian and Australian 16x18x18 compressed bales in addition to standard compressed bales. 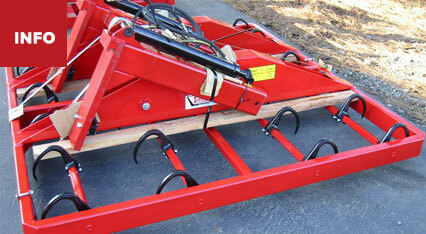 Our bale clamps offer an inexpensive method of moving small square bales of hay. 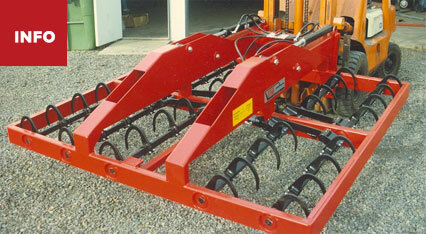 They are built to handle stacks of bales up to three layers high and 4-5 bales wide. 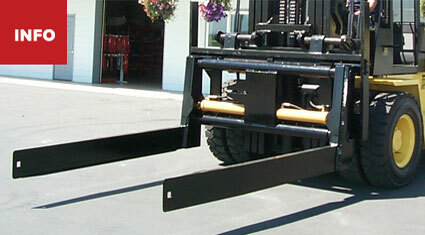 What’s more, they can be mounted on any loader and offer years of maintenance free service. 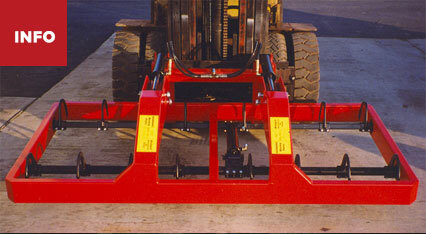 Our bale clamps offer an inexpensive method of moving small square bales of hay. They’re built to handle stacks of bales up to three layers high and 5-6 bales wide. Also available in a Heavy Duty version with smooth side plates for loading in and out of freight vans with minimal side clearance. Our rugged, durable STOR-800 bale squeeze is designed specifically for handling squeeze blocks of 48" long bales with multiple cross tie layers or stacks of big bales. 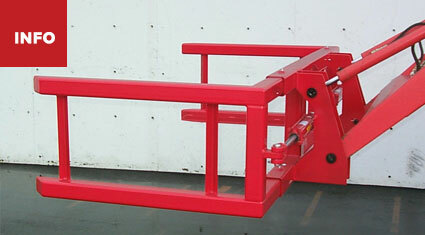 It features tempered steel forks, rigid welded construction, 4140 slide shafts and 4" clamp cylinders. What’s more, it can be adapted to mount on 15,000 lbs or larger capacity loaders, and can also be ordered with our optional side-shift feature.